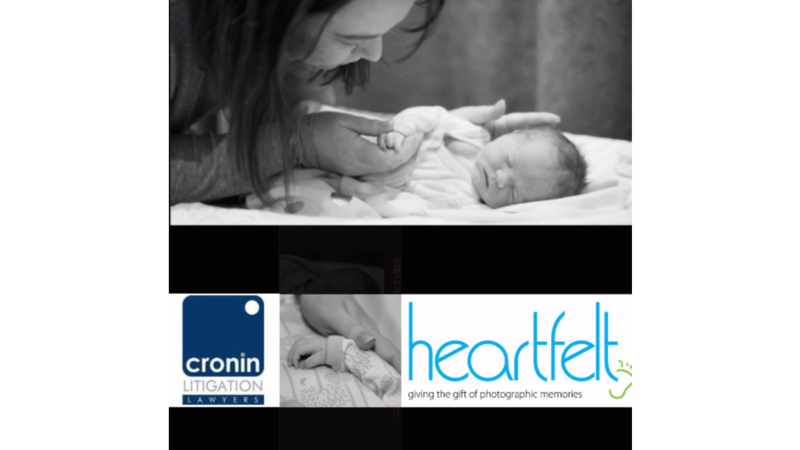 Cronin Litigation Lawyers are proud to be putting in a team to run in the Gold Coast Marathon and raise funds for Heartfelt, an organisation which gives the gift of photographic memories to families who have lost a child to stillbirth or serious illness. The Stillbirth Foundation in Australia reports that 2190 stillbirths occur each year. That is 6 families a day. That statistic is devastating. Partner of the firm, Stacy, and her family, were sadly one of those families in Australia last year to suffer the tragedy of stillbirth. This year the Gold Coast Marathon is being held on the weekend of 2 and 3 July 2016, just a few days before the first anniversary of the birth of Audrey Lee Miller, on 6 July. Audrey was born sleeping, just two weeks before her due date, after a tragic complication with her umbilical cord. The Miller family have been left devastated and grieving the lost life of a precious daughter and sister to their other two daughters, Scarlett and Madeleine. The team at Cronin Litigation have shared this devastation with Stacy and her family. The professional photographers who volunteer their services to Heartfelt are exceptional people entering the lives of families at their most difficult and devastating time as they say goodbye to a much loved and longed for family member. For Stacy and Neil, and Audrey’s two sisters, they had to leave the hospital with empty arms. Heartfelt gives families lasting memories in circumstances where the opportunity to make new ones has been taken from them. In honour of Audrey, in support of Heartfelt, and to raise funds for photographic supplies and equipment, and even cameras for remote hospitals to give a lasting gift to families who have suffered an unbearable loss, we have set up a Cronin Litigation Lawyers team fundraising page where you can donate and assist with this great cause. They aim to reach $4,000.00 before 3 July 2016 and we are grateful for any donation. Choice has donated and you can donate HERE.